Engine Company #1 of Hilo and the Fourth of July, 1865. Engine Company Number 1 of Hilo.—J. A. Kealohanui of Hilo, Hawaii wrote of the appearance of the cheerful boys of that Company on this past 4th of July. On the night of the third, they went to the house of Poonahoahoa [Thomas Spencer], and there they played their horns and drums, which woke him up, and he came outside and thanked them. On the next day, they went there again, and from there to the place of the Governor [Keelikolani] and gave her three cheers, and three for the Hawaiian Flag. She remarked that this is a fine Company. With them go our warm aloha. Ka Nupepa Kuokoa, Buke IV, Helu 29, Aoao 2. Iulai 22, 1865. A Hawaiian dies far away from home, 1917. It was from the steamer Ventura that news was heard of the passing of a Hawaiian mother well known by those of Hilo and Honolulu, that being Mrs. Meleana Keomailani Kenuwe, and her bones will be left in foreign lands where she lived for a long time, for 17 or more years. She left her beloved community of her homeland in 1888 to go live with her daughters, Jessie Kamokukaha Wilson and Mrs. Mary Kinoole Shotlz. Her sons-in-law worked planting fruits in the county of Santa Clara, an area in California that is fifty miles from San Francisco. She was born in Honolulu in 1829, and died at 76 years old. Mrs. Caroline Paakaiulaula Bush of this town is her younger sister, and here also is her son Alfred Kapahukapu Kenway. She has ten surviving grandchildren and ten great-grandchildren. How sad for that beloved mother who has passed; she is a native and well-acquainted with living in the Lanipili rains of Hilo. When her daughters were young, she was a travel companion of the Lady Treasurer of this Aloha Aina newspaper [Emma Nawahi], and she was a favorite in the bosom of that beloved lady who has passed on. Aloha no. That path which she has taken is one we must all take. The Aloha Aina shares in the sorrow of the family of that beloved mother who has gone. [It is good to note that sometimes there is the same Hawaiianization for different haole names. When one hears Kenuwe, we would usually think Greenwell, but here we see that it is what Hawaiians called Kenway. Ke Aloha Aina, Buke XI, Helu 27, Aoao 5. 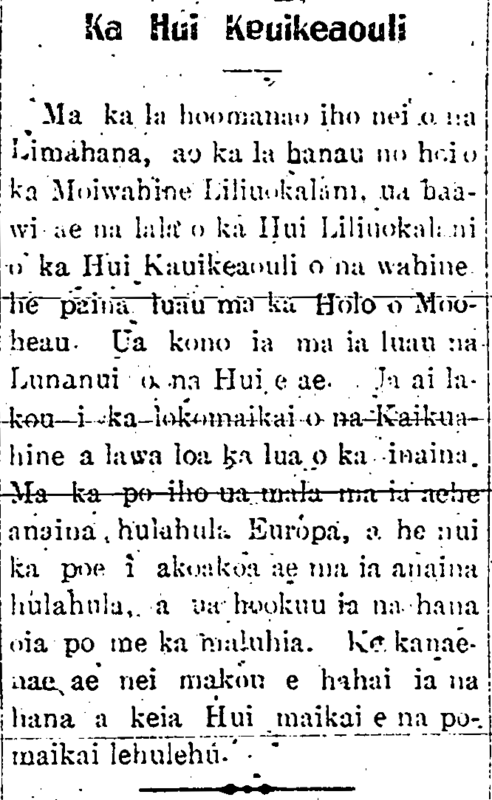 Iulai 8, 1905. Hawaiian returns home to Hilo after living in Boston for 50 years, 1917. In the morning of last Friday, the steamship Matsonia docked in Hilo nei, and aboard the ship was Mr. Benjamin Keolaokalani Pitman [Pittman], the brother of the recently deceased Mrs. Mary Ailau. He left left Hilo when he was 10 years old, and went back with his father to the city of Boston, and he has lived there for a full 50 years, and this is the first time he has returned to see the place where he was born. He is a direct cousin to George Mooheau Beckley, as their mothers were sisters; Kinoole is Mr. Pitman’s mother, and Kahinu is George C. Beckley’s. The two of them were daughters of the Alii Hoolulu who hid the bones of Kamehameha Ka Na’i Aupuni. He [Pittman] went with his people on a tour to see the fire of the enchanting woman of the pit, and on their return, they were entertained at the home of Mrs. Maraea Wilipaona [? Mrs. Maria Wilfong], and Mrs. J. D. Lewis and Mrs. Wilfong put on a luau to honor this Hawaiian Alii. On this trip of his to his homeland, accompanying him were his wife and some friends from Boston. On Saturday evening, he and his wife left for Honolulu, and from their they will return to his home in Boston. He is now a Millionaire living in Boston. Ka Hoku o Hawaii, Buke 11, Helu 37, Aoao 2. 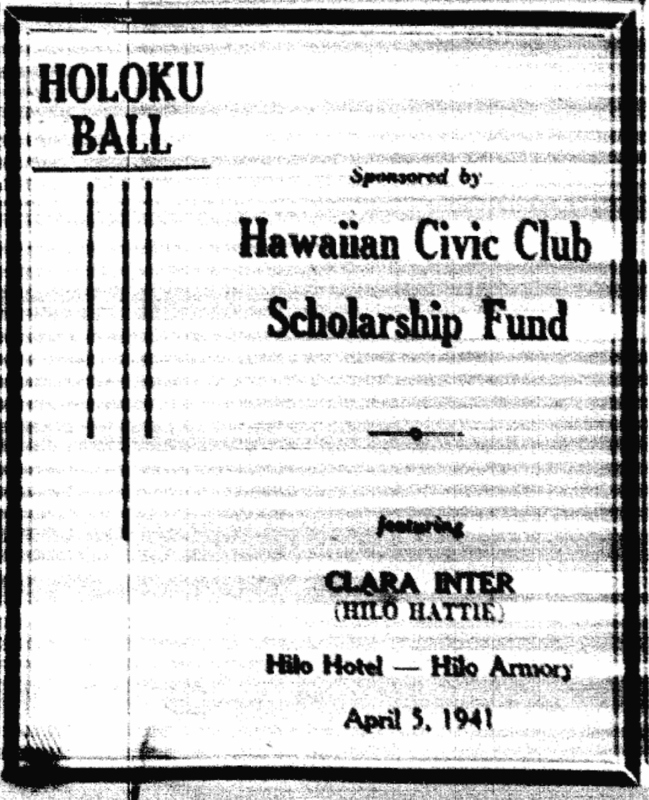 Hilo Hawaiian Civic Club’s Annual Holoku Ball, 1941. 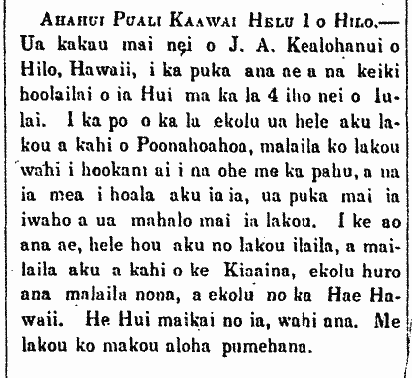 Ka Hoku o Hawaii, Volume XXXV, Number 49, Aoao 4. Aperila 2, 1941. Hilo Hattie on her way to Hilo, 1941. 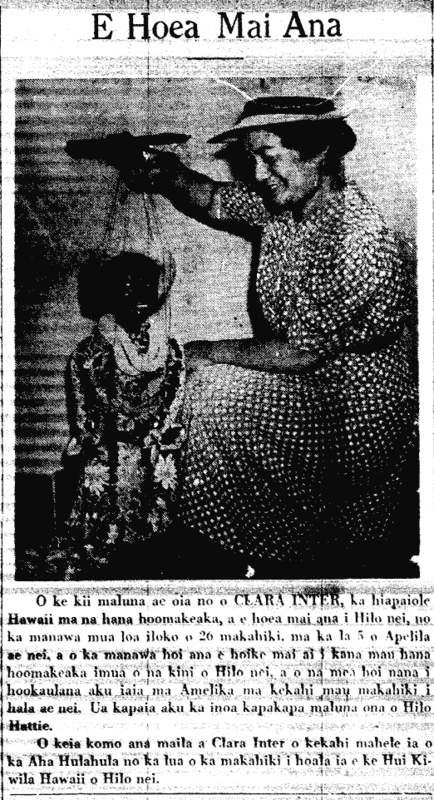 The picture above is of CLARA INTER, the Hawaiian champion of comedy, and she is coming to Hilo nei, for the first time in 26 years, on the 5th of this coming April; and this is when she will be showing her humor before the people of Hilo, and what she was made famous for in America some years ago. She is nicknamed Hilo Hattie. Clara Inter is part of a Dance [Holoku Ball] put on for the second year by the Hawaiian Civic Club of Hilo [Hui Kiwila Hawaii o Hilo]. 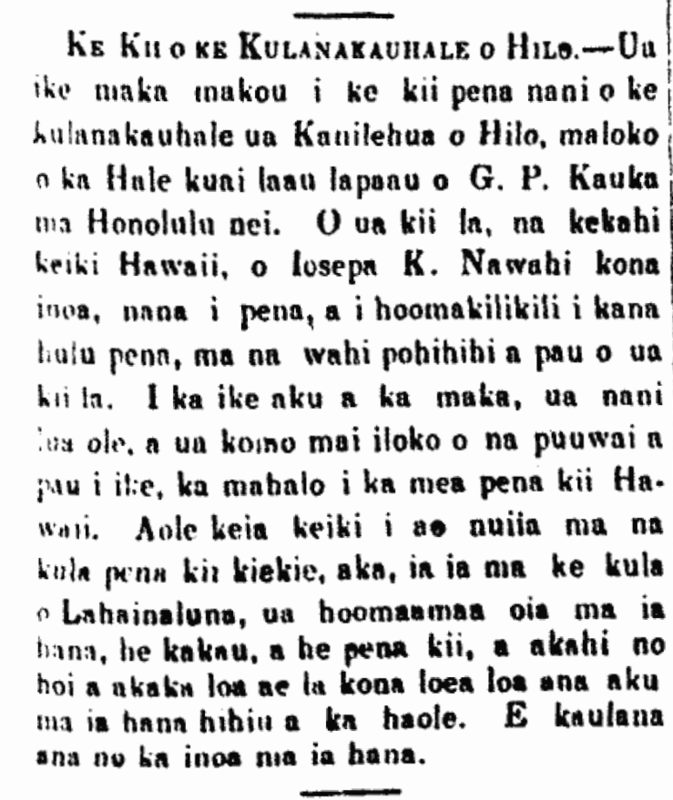 Ka Hoku o Hawaii, Volume XXXV, Number 48, Aoao 1. Maraki 26, 1941.